Whether it's your hubby, dad, boss, brother or uncle, shopping for guys can be harder than shopping for gals. One things for sure, men like gadgets and things that make noise and you can play with, I like to call them expensive toys. Here's a take on a few ideas for the special men in our lives. Watches are to men what shoes are to ladies. The Gently Glove by Swatch is a chronograph timepiece for the diversified watch collector. Brushed with pink gold, it has a sophisticated but not soft, masculine but not bulky style. For the amateur documentary maker, the Flip Mino HD is hands down an amazing gift. It makes it easy to record fun and impromptu moments with professional quality. To really top it off, it's easily adaptable to PC and MAC and editing makes you feel like a young Spike Lee. This is super cool, for gals as well. You can transfer a song, video or two that your friend has with no problem and in a matter of seconds. I may put this on my list. 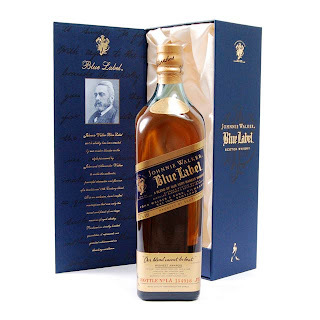 Make his day with this distinct and very personal touch on a bottle of JW. Every time he takes a swig, he'll be thinking of you!